The perfect yacht for modern, elegant on board living, with extensive guest spaces on offer, Kinta is sure to impress anyone who steps on board. Having undergone a major refit in 2010-2011 she has been beautifully maintained and is the epitome of a stylish and well-built yacht. 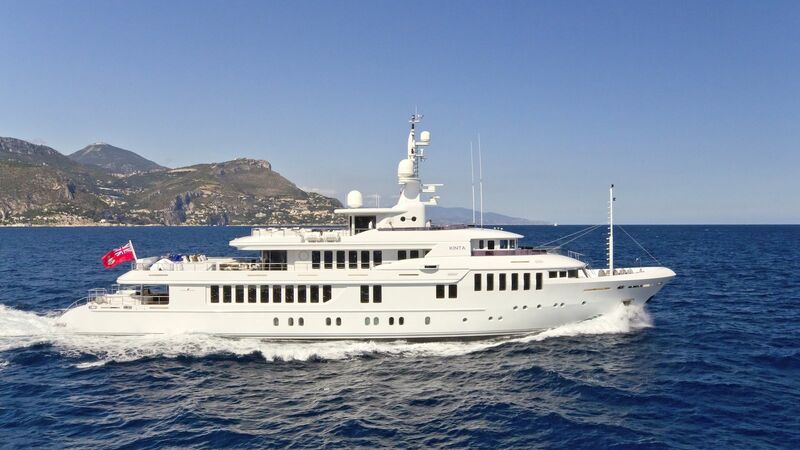 The yacht is able to welcome twelve guests in six staterooms: the master, VIP, three doubles and one twin. The owner’s space is particularly impressive, making use of the full beam to create a large and private space with floor to ceiling windows filling the space with light and providing 180 degree views. High speed satellite internet and WiFi throughout the vessel ensure seamless connection when on board, and all main guest spaces boast advanced entertainment and AV systems. Kinta also carries a large collection of water toys. Click here to find all Charter Yachts. Kinta comfortably accommodates twelve guests in six luxurious staterooms: the master, a VIP, three doubles and one twin. The owner’s cabin is particularly impressive, making use of the full beam to create a large and private space with floor to ceiling windows filling the space with light and providing 180 degree views. A centreline main bed is complemented by a private study and lounge, oversized walk in wardrobes, and direct access to the forward deck. The full beam VIP stateroom is another impressive space, with its own lounge and large ensuite with a Jacuzzi. Four further guest cabins offer equally large and beautifully styled spaces for guests to retreat to. An elevator and main staircase connect all guest decks for easy movement around the yacht.